Did I read this right: I can buy Borderlands the Presequel for 12, or Presequel + Season Pass for 17.50... Or I can get the handsome collection (which is Presequel+ 5 DLCs, i.e. season pass) for $6.55?!?! Not really. It looks like the collection is $20.35. However, they will give you credit for anything that you already own. In my case that drops the price to $11.77. You apparently already own more of the bundle than I do. I seem to recall hearing very good things about Hellblade. Like, phenomenal things. I haven't played it but it is *very* short, like 7-8 hours. But still very nicely done and something you really should use headphones with to get the full effect of all the voices in her head. Here's a ramdomly chosen review to hopefully help. Daily Deal is the same. Anyone have an Icewinds Dale key from a bundle or something they want to sell me? I'm looking for a copy asap and I don't want to spend the CAN$20+ it is at the moment. I have so many back-logged AAA games, but I'm not sure I can resist Assassin's Creed Origins at that price. I'm not even going to look at the pile of books and board games. This is similar to Conan Exiles in the same way I am similar to Alpha Centauri. On the flip side I think my kids would really like it, which also makes it very different from me. 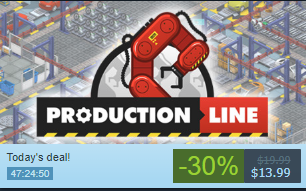 I kinda want to click that Daily Deal link, but I more want to keep my job. It all comes down to how draconian your policy is. Why is the water always white in these games? - DiRT 4 or Rally. Oh thank goodness. I missed the last Warner Brothers sale that ended 47 minutes ago. Glad they're having another one. My thought as well. Oh now I can finally get the Arkham games on sale... again. Tempted to pick up the South Park sequel since I enjoyed the first one, but I have no time to play now and suspect will go down even more in price. Jag wrote: Tempted to pick up the South Park sequel since I enjoyed the first one, but I have no time to play now and suspect will go down even more in price. If you're like me, you always wait for really good sales on games you're never going to play. I noticed that Vaporum - Steampunk Dungeon Crawler, is on sale as well today - quite a few people here have that on their wishlist (me included). I found myself buying more games, but never having the time to play them, now that I picked up a side gig (ghost-writing blog posts) that adds about 20-50 every week to my coffers.